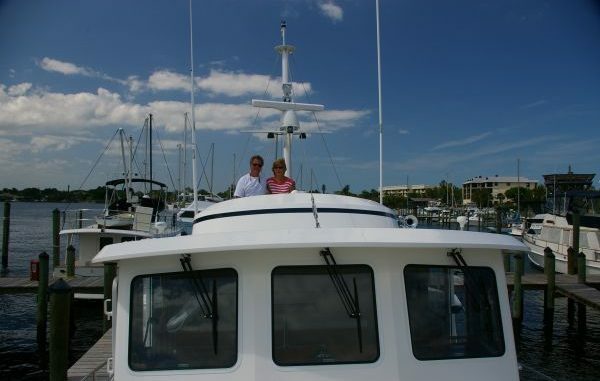 A beautiful Kadey Krogen 44 Trawler is the first power boat for these new owners. Making the transition from a 46 foot Mason Ketch, they want to learn the different handling characteristics of the trawler as compared to their older sailboat. 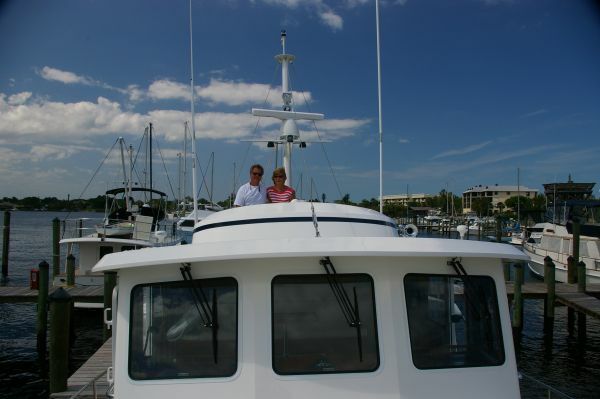 Their goal was to bring this new yacht up to the Chesapeake Bay for the summer and do some coastal cruising next fall. We started with a review of equipment systems to learn what is where, how it functions and the basic start up procedures for the equipment. Naturally we checked all fluid levels including engine oil, coolant, transmission fluid level, diesel tank levels and hydraulic stabilizer fluids. 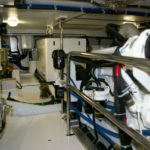 Other important discussions included black water & potable water tank levels and spare fluids for oil and fuel filter changes, and yes we checked the generator too. After getting the boat started and shore power switched to ships generator power, we then disconnected the power cables and dock lines ready to start our two day vessel indoctrination. Out into the St. Lucie River we put the boat into some sharp turns, port and starboard, to get the feel of the boat’s turning radius and stopping ability. Then we headed back to the marina for docking practice – a very different experience in a power boat vs sail. Next, we docked bow-in a few times then started backing stern into the slips, both owners taking turns on fixed and floating docks alike. 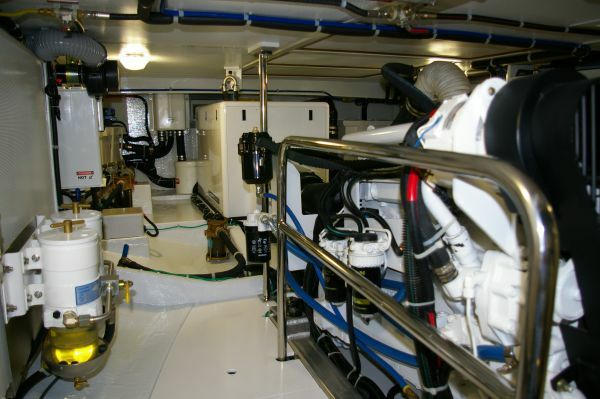 This is a single engine boat with a hydraulic bow thruster. 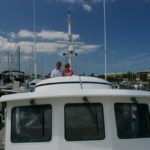 The maneuvering procedure for this type of boat is to keep your rudder midship and use the gear shifter and bow thruster to steer the boat into the slip. 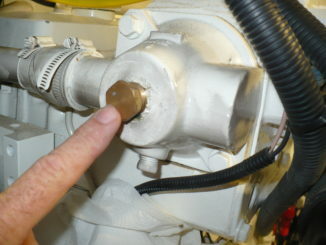 Since the reverse gear tends to walk the boat starboard this is an advantage to use when backing. After more dockings than any of us can imagine we set out for a run in the river. Anchoring can be a scary prospect if you are not prepared. 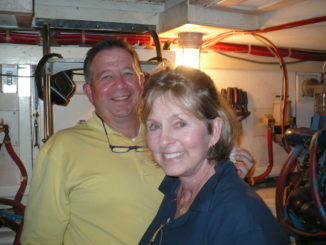 We headed toward a quite anchorage to practice using the windlass and MAX anchor. After deciding on the best site based on wind, current and bottom holding we set the hook, again, again and again. Heading back to the marina at the end of the day we discussed the personality of the boat and the skills learned. Day two we started with more dockings, stern-in. 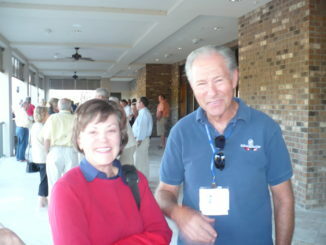 Since we are in Florida and most all the snowbirds have started north we had a marina that was fairly empty. Using this to our advantage we backed into the first slip, moved out and backed into the immediate slip next door. We did this for 5 slips in a row. After mastering this we went up the river and anchored again and then launched the dinghy with the electric winches on the mast and boom system. Again we had a meeting to review the day and then made lists of recommended items to have aboard for spares on their trip North. This was a good two day practice and preparation for the owners to cruise to the Chesapeake Bay before hurricane season begins. Jump start our cruising future! Dream Fever is feeling fine!